While slumber binds our breasts! May open find the door! To glory by His grace. When we with them appear. And ever bless His name. We shall in God rejoice. Bid us its riches share. And wipe away our tears. 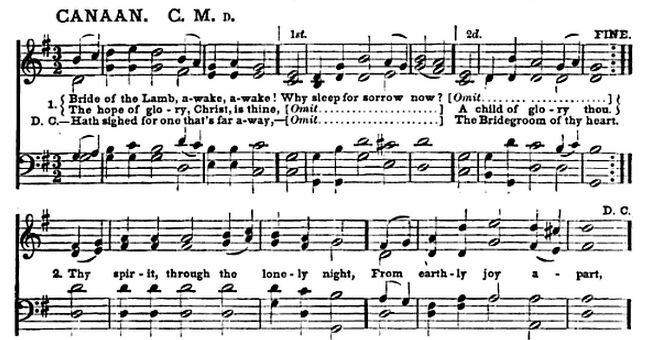 Sheet Music "Canaan" from Charles Seymour Robinson, ed., Psalms and Hymns, and Spiritual Songs (Presbyterian Committee of Publication, 1882), p.447. Hymn #67 from The Lutheran Hymnal (St. Louis: Concordia Publishing House, 1941). This text was converted to ASCII format for Project Wittenberg by Cindy A. Beesley and is in the public domain. For more information about Project Wittenberg, contact Rev. Robert E. Smith of the Walther Library at Concordia Theological Seminary, 6600 N. Clinton St., Ft. Wayne, IN 46825 USA.